Scrap yarn blankets don't sound like they would be beautiful. After all, how can you use leftovers to make such a large project? You might be surprised. There are many different ways to combine different scraps of yarn to create a cohesive afghan. These crochet blanket patterns provide you with a number of great options. This crochet blanket pattern teaches you how to work a basic chevron stitch. This design, also known as a ripple or wave, is perfect for a scrap blanket. As you can see in the example, the designer has alternated variegated yarn with solid yarn for a powerful effect. Not every row is made entirely with the same yarn. Nevertheless, the finished blanket looks like an intentional design. This particular pattern was worked with worsted weight yarn. Go beyond a basic chevron stripe with this zig zag crochet pattern. It is made triangle by triangle. Each color is built upon the last, so you can use even tiny scraps of yarn to start these triangles. Therefore, this is a true stashbusting project. This is a free crochet blanket pattern that really packs a color punch. The black border on this crochet blanket provides the perfect background for all of your colorful bits of scrap yarn. They shine like jewels in this setting. This blanket is made primarily using double crochet stitches. However, it also uses an extended treble crochet stitch, worked into a stitch from the row below, which is a fun technique to practice. This scrap yarn crochet blanket pattern uses another variation of the drop stitch or extended stitch idea. This one is more dramatic, particularly with all of the color changes throughout the project. Nevertheless, it is a really simple pattern. It has a one-row repeat, plus the crochet pattern comes with photo tutorial instructions. This crochet designer dug into her stash and pulled out all of the bulky yarn that she had. Then she used a size N crochet hook to work it up into a granny square blanket. Although she shares the yarn she used, you can use any yarn that you have in your stash. Granny squares are great scrap yarn blankets; just use one color until it runs out and then switch to the next color. One option is to arrange them by the smallest amount to largest amount since the inner squares will be smallest. Alternatively, arrange them in preference of color combination. You do not have to crochet your scrap yarn granny blanket in the round. A great alternative is to make granny stripes instead. Learn how with this free crochet pattern, which also has an accompanying video tutorial. Use all of the yarn in your stash to create a blanket in the size you desire. 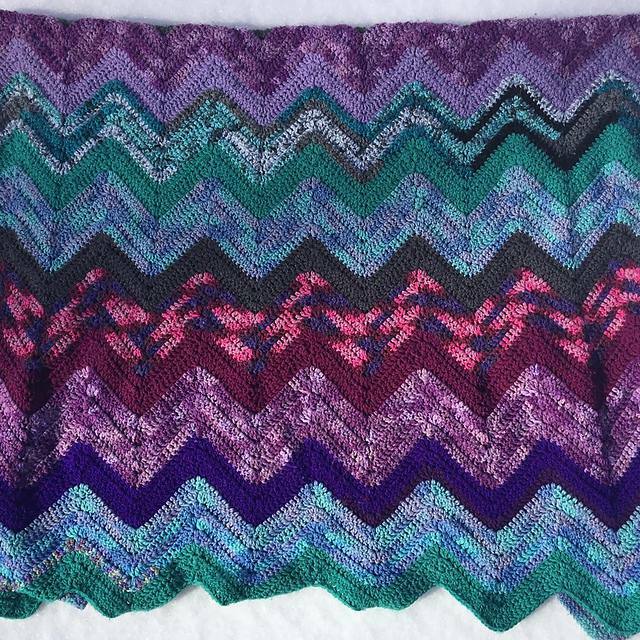 This blanket's designer suggests that combining your scrap yarn with a main color is a great way to get a cohesive blanket design. She used a white acrylic yarn throughout, double-stranded with her variety of scraps. She used all different weights of yarn for that second scrap yarn. Worked entirely in single crochet, this is a very simple blanket that is also cozy and warm. 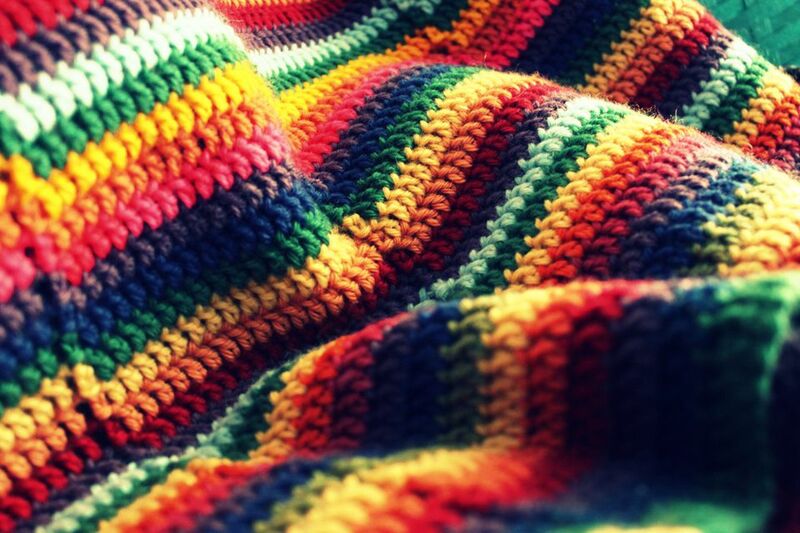 Any colorful striped crochet blanket pattern lends itself well to a scrap yarn project. Simply change yarn at the end of each row, alternating colors based on the yarn that you have in your stash. This is a simple stacked shell crochet blanket pattern worked with basic crochet stitches. Of course, motif-based blanket patterns can also lend themselves to working with scrap yarn. This crochet blanket is based on hexagons, with color changes for each round of each motif. Therefore, you can just use what you have to make each motif. Join it all together with the same yarn color to get a cohesive design. That single-colored background is truly the key to making any combination of colorful sections into a blanket that looks well-designed. In this design, you can make colorful double crochet squares and rectangles using your scrap yarn. Then you lay it all out and fill in the background. The end result is a beautiful graphic design. If you choose a neutral yarn for the main color then you will have a very chic contemporary blanket.